Mobile technologies are helping businesses of all sizes reduce costs, improve customer engagement and open new revenue opportunities. Point of sale, barcode scanning, dispatching and task management are just a few of the processes that can improve dramatically with mobile devices. Many organizations go through a series of stages before establishing a mature approach to mobility. Stage 1: “We don’t need mobile technology.” If you are reading this, you’re likely past this stage. Stage 2: “We can allow BYOD.” You want to reap the benefits of mobility and save money via employee-owned devices. Stage 3: “We should invest in mobile technology.” You’re ready to commit to mobile and have begun exploring your options. Stage 4: “We should optimize mobile technology.” You’re committed to mobility and are looking for the hardware, software and management tools that will best support your business processes. If you have already decided that mobile technology is part of your business strategy and you would like to optimize it, you might want to consider whether Mobility-as-a-Service (MaaS) is the right approach. Organizations large and small use MaaS. Large organizations that have internal resources for managing most smartphone deployments might utilize MaaS for a specialized deployment of tablets to the sales force or mounted in trucks for service. Large hospital systems might offer some services to all departments, while individual departments contract for devices to address a unique need. For most organizations, the pace of change in mobile devices, security and management systems creates a level of complexity and risk that MaaS addresses very well. 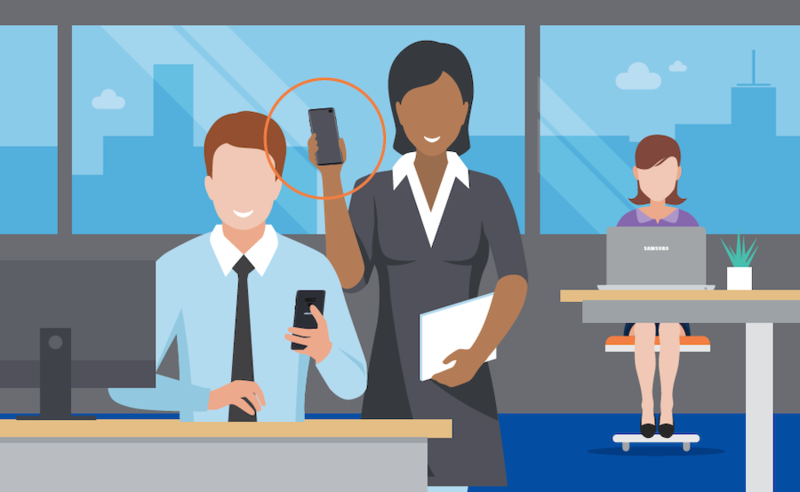 Any organization that wants their workers to utilize their mobile technology will want to provide a level of consistent support, access and reliability that will probably be difficult for a small- or medium-size IT shop to offer. It’s also something that many larger IT shops would prefer not to manage. Get your free guide to matching the right smartphone with your business and employee needs. Oxford Economics recently published an in-depth analysis of the total cost of ownership (TCO) of mobile programs. It was written with enterprises in mind, but the principles apply to organizations of all sizes. It’s worth noting that the cost of internal labor can be higher in smaller organizations, because the life cycle of mobile devices has many disconnected steps that can be hard to automate or systematize for a small device fleet. The hardest cost to control in a new program is labor. Estimates by Blue Hill Research suggest two to three full-time resources are required for every 1,000 devices. When mobility management is new, managers face a learning curve that can slow them down and increase management costs. Remember to value internal labor as a loaded cost (labor rate plus cost of benefits, taxes and overhead). Most MDM solutions have updates that occur multiple times during the year. Each update needs to be tested and implemented to ensure compatibility with internal systems and processes. Mobile operating systems tend to update a few times a year, and these updates are critical for maintaining a secure environment and should be managed proactively. Even if you negotiate a favorable rate with mobile network carriers, an unmanaged contract can quickly involve overages or unneeded services. Telecom expense management or mobile data services can be included in MaaS packages to reduce the risk of unforeseen costs. Mobile devices break or go missing at a rate of between 1 and 5 percent monthly, depending on how they are used. Each incident needs to be mitigated and resolved, and slow response can reduce productivity and stress out employees. When Is MaaS a Poor Fit? There are a few instances where it might not be worth investing in MaaS. MaaS is a subscription-like model, so if your program does not warrant updates or changes over 18 to 24 months you may be able to make the case for buying devices and systems yourself and hiring staff to support them. Business phones and tablets that are used daily, however, rarely fit this profile. Devices that are used by or in front of customers will likely need to be refreshed every 12 to 18 months. While many organizations will follow the four-stage process above, it is actually far more advantageous to utilize MaaS as part of the building of your program, rather than as a step in its later maturity. Working with a partner that can provide professional focus on the details of devices and systems alleviates the day-to-day burden of developing a program, so that management can devote its attention to refining the business process you are mobilizing. Learn how Samsung’s small business solutions can help you scale your growing business every step of the way.